I hope your interest in God’s Covenant was piqued after Wednesday night’s discussion. In the next 2 weeks, we will be covering a lot of information, which is why I wanted to write a few blogs to cover some material in between meetings. If you were not in the group that had to read Exodus 25, please take a few minutes right now to read it. Why was God so detailed in how he wanted the tabernacle made? Why did everything have to be made to his exact specifications? What is the importance? Hebrews 10 says that the Law is but a shadow of the good things to come. God is revealing Jesus, the ultimate fulfillment of His promises, throughout His covenants and requirements of the people. We will take a look at a few examples this upcoming Wednesday, but the tabernacle is something that requires more time not only to explain, but also to ponder and truly understand as it applies to our lives. 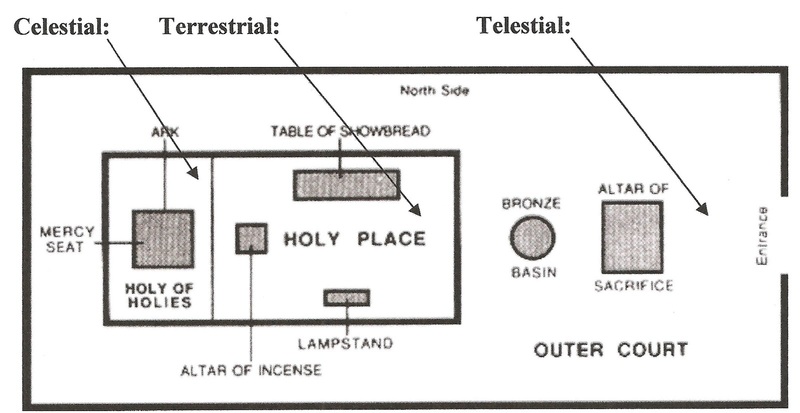 Look at this picture of how the tabernacle is laid out. The following descriptions are excerpts from Kay Arthur’s study “Covenant”, pages 152-154. “The outer court was 150 feet long and 75 feet wide. The tent was always pitched toward the east and the rising of the sun and could only be entered through this one door. The children of Israel could enter through the gate into this outer courtyard. “The holy of holies… was 15 by 15 by 15… It was separated from the holy place by a veil. This part of the tabernacle was only entered by the High Priest on one day of the year, the Day of Atonement. Isn’t this amazing, that God literally made his tabernacle to be a shadow of the coming Savior, His Son, Jesus Christ? Each element inside the place God dwelled and the people interacted with God was a picture of Jesus, who would become human for us and take on our flesh that we might be saved. What have you done with your sins? Have you given them to Jesus, or do you still cling to them in the darkness? Have you allowed Jesus to cleanse your evil conscience, as it says in the verses we read on Wednesday night in Hebrews 10? Have you allowed Jesus to wash you clean? Have you walked through the door into the holy place? Are you still spiritually hungry, or have you taken the bread of life? Are you standing in the light of the lampstand, or are you continuing on in darkness? Have you come to understand and live in a way that honors the fact that Jesus gave himself to us so we would walk into the holy of holies with confidence? Have you truly trusted Jesus to forgive your sins? Have you found His mercy? Take a moment to “walk through the tabernacle” into the holy of holies. Recognize all that God has done for you so that you can stand with confidence before Him BECAUSE of His great love for you, that He would become the sacrifice, shedding His own blood (God incarnate Jesus), and place Himself on the mercy seat FOR YOU… Take a moment to say “thank you”, and I encourage you to begin thinking about what this covenant means for you. God fulfilled the covenant Himself, but invites you in… We will talk about it more in the few weeks to come, but begin thinking about what these covenants mean to you. Those questions are convicting! It took me reading through it at least three times to truly realize the ramifications of not accepting of them, of how they interrelate and are essential to my walk with God. In order to FULLY follow Jesus Christ, I have to FULLY accept His sacrifice. Hebrews 8:5 They serve at a sanctuary that is a copy and shadow of what is in heaven. Suppose there is a Temple in Heaven??? ?